For several years I had tall growing Gladiolas planted along the unsightly 6 foot tall chain link fence. The summer blooms were spectacular as the flowers and foliage disguised the bare fence for a few weeks during the summer. Amongst the “Glads” were other lovely perennials. Combining bulbs with perennials creates a harmonious relationship where each supplements the other without one being a dominate factor. In my own landscape I had Lily Of The Nile, Society Garlic, Sea Lavender, Daisies, Flax, Fortnight Lilly, and Iris. Of course you could always use your imagination and do what you like and appeals to you. The fresh colors and texture of the emerging foliage of perennials offers unique opportunities for contrast or complimenting colors with flowering bulbs. (This combining or contrasting of colors between different plants is called “color echoing” and is an important way to tie plants together in the overall design). An added benefit is that the new growth of the perennials will hide the dying foliage of the bulbs once they have finished flowering! And not long after that of course most perennials themselves will bloom, thus smoothly extending the sequence of flowering plants for you to enjoy. Bulbs are among the easiest flowers to grow and also the most stunning beauty to enjoy. Even the most novice gardener can create a breathtakingly beautiful spring, summer and fall garden with bulbs. Do you enjoy the flamboyant flower colors of Dinner Plate Dahlias? What about marveling the sensational blossoms of Begonias? What would you do if you wanted a rainbow of colors in your garden from mid to late spring and summer? What if you wanted to savor the yummy goodness of Onions, Shallots, and Potatoes that would has spring bulbs to plant now for you to enjoy in a few months from now when your garden will be decorated with glorious flowers and wholesome organic Potatoes, Onions, and Shallots. Dahlias reign at the top of every gardener’s spring planting list. They are one of the most versatile staples of the gardener. When they bloom it puts a smile on my face and warms my heart. Dahlias add a tropical feel too almost any sunny landscape and it is no wonder that The National Garden Bureau has named 2019, the Year of the Dahlia! Other staples in the garden for the shade are Calla Lillies, Begonias, Asiatic, and Oriental Lillies which come in a kaleidoscope of colors. Not only do the Dahlias, Begonias, and Lillies flourish in containers and borders, they attract hummingbirds and are an absolute must in summer /fall flower arrangements. For the edible connoisseur, consider our many varieties of Onions, Potatoes, and Shallots. What I like about planting bulbs is that before you know it in just a few or more short months you will be rewarded with a fascinating floral display of gorgeous plants that are easy to grow. Did you know that a flower bulb is really a self-contained flower factory. Within this marvelous little package is nearly everything the flower needs to come to life. It’s amazing how these plants transform from an unattractive bulb to something so beautiful. Flower bulbs make the most striking display if you plant them in large swaths or groups. A large clump of one color attracts more attention than if you plant just a few here and there. What I have done before is to grab a handful or several handfuls of bulbs, close your eyes and toss the bulbs and where ever they land you plant them. It is more natural and random but also quite effective and stunning at the same time. Generally space bulbs 2x their width apart and plant them 3x as deep as they are high. Always plant flower bulbs with the pointed ends up. Adjust your planting depth according to the size of the bulb.To enjoy the bulbs fabulous flowers means planting ahead and being a little patient at first until they come up from the ground. Planting them is simple, simply “dig, drop, done” in one season then “delight” in the next season. When planting Dahlias start tubers indoors in containers to get a jump on summer blooms.The rule of thumb’ is to plant in the garden when it is time to plant Tomatoes. It is wise to not plant too deep, the crown of the tuber should be just below or at soil level. It is recommend to stake at planting. Dig up after the first hard frost and divide tubers in spring. When planting Begonias, do not plant too deep, the rounded side should be down, hollow side up just below or at soil level. I recommend adding organic compost to enrich the soil and to nourish your bulbs. 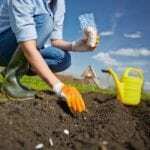 When planting bulbs I also suggest using bone meal and mix a little in the planting hole before the bulb is inserted into the soil. I advise to not plant bulbs where water puddles, where there are low spots, under drain spouts or other soggy locations because this will cause bulbs to rot. 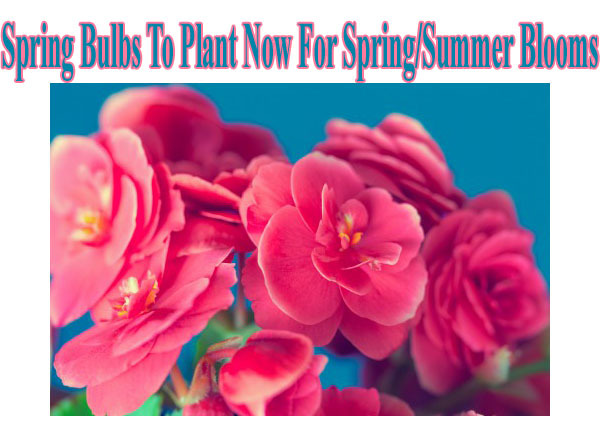 All bulbs you plant now will go dormant when the weather stars to get cool again. But don’t be alarmed they will re-appear again next year in the spring. The bulbs you plant now (spring bulbs) are the roots of a dormant plant. You plant the bulbs now, in a couple of months or so tiny shoots will emerge from the bulb, then they will begin to bloom a few weeks after that. When the blooming cycle is done and as the end of summer approaches, the plants look tired and are getting ready to go dormant for the winter. This is when you cut them down to the ground, next spring they will re-grow again. I encourage you to plant spring bulbs now (while supplies last) so you will be rewarded with beautiful flowers and tasty and nutritious food.